At least 27 people have been killed, including many children, in a shooting attack at a primary school in the US state of Connecticut, US media say. 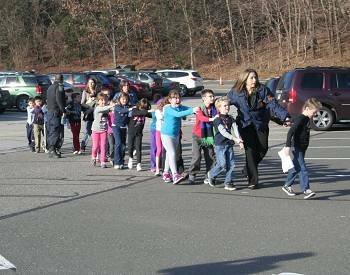 At least 18 children are among the dead at Sandy Hook Elementary School in Newtown, the Associated Press reported. Earlier, the gunman was reported to have been killed and at least three people were taken to hospital. A news conference is imminent and the state Governor Dannell Malloy is on his way. Police arrived at the school soon after 09:40 local time, answering reports that a gunman was in the school’s main office and one person had “numerous gunshot wounds”. Scores of officers at the scene carried out a full search of the site. Schools across the district were immediately on lock-down as a preventive measure, officials said. Meanwhile, the three people who have been taken to hospital are in “very serious condition”, Danbury Mayor Mark Boughton told CNN. One witness speaking to CNN said that shots were heard coming from the hall. There “must have been 100 rounds” fired, she told the channel. Local media have reported that firefighters instructed children to close their eyes and run past the school’s office as they exited the building. Other sources suggest that some of the shots were fired in a school classroom. According to CNN, the shooter’s body was in one of the school’s classrooms. There were unconfirmed reports of two shooters, according to a report in the local Hartford Courant newspaper. With the children now evacuated, aerial images of the school show several emergency vehicles still at the scene and scores of cars surrounding the area. Teams of officers are on the scene, some with dogs, as a thorough search of the school continues. A local NBC news channel said that a hospital in nearby Danbury had reported receiving three injured patients. Several parents are reportedly at the school, standing by and waiting for more information. Officials say they are trying to unite children with their parents. Sandy Hook School – described by correspondents as a highly rated school – has cancelled its kindergarten class on Friday and will not operate midday bus runs, the school’s website says. The public school has more than 600 students in classes from Kindergarten to 4th Grade – including students aged from five to 10. White House Press Secretary Jay Carney told reporters that US President Barack Obama had been informed of the incident and was receiving regular updates. On its website, Danbury Hospital said it was aware of a “situation” at the school. “Please know we’re collecting facts now and will be back to you as soon as possible with the most accurate information,” the hospital said in a statement.